As your biggest fan, I have to say I CAN'T WAIT!!! Love your creepy stuff, but I adore your action stuff and your other stuff. Heck, I just like living in your "worlds". LOL. Aw, shucks, thanks so much! I'm glad other people don't find my worlds strange places that they'd rather run screaming from! Be sure to let me know when you get yours up, Susan. Marilyn, so glad you took the time to participate in the tag. 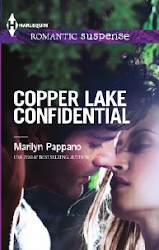 I love your Copper Lake stories, and learning about your upcoming book.